Lorne was hugely popular with visitors from Melbourne, Geelong and the Western District. North Lorne was called ‘little Colac’ for a time as holiday makers made the big trip over the Otways to spend some time in the sun at Louttit Bay. By 1922 the Great Ocean Road was extended to Lorne making the town more accessible and its reputation as one of the great holiday spots in Australia grew. 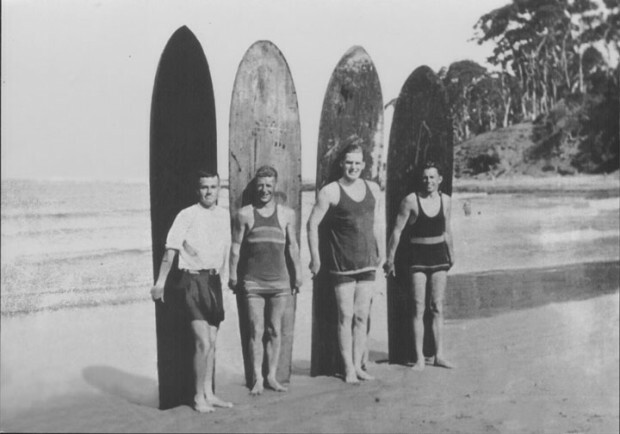 Surfing came to Lorne in 1920. A Geelong gentleman by the name of Louis Whyte travelled to Hawaii in 1919 and spent six months learning to surf at the famed Waikiki Beach. He managed to ship four gigantic solid redwood surfboards back to Australia and in 1920 rode them for the first time at Lorne. Lorne has been a popular surf spot since that day and is the birthplace of Wayne Lynch, one of the greatest surfers the world has ever seen. In the fifties and sixties it was ‘ground zero’ for Victoria’s surfing community with ‘surf stomps’ held in the Wild Colonial Club . ‘The slop, the mashed potato, mod, nod, hitch-hiker, the swim, the frug and a dozen other indescribable dances are performed to the thumping beat of drum and guitar emanating from the inevitably hirsute group on the platform.’ The Age, 15 July 1966. While the nightlife in Lorne was freaking out parents and the establishment alike, ‘The Arab’ café in Lorne was one of the first and finest coffee places along the coast with its espresso machine (only the third in Victoria), bikini clad waitresses and toasted sandwiches. Surfers and bohemian types would lay sprawled on cushions discussing the waves, poetry and Plato while live music spilled out onto the street. Lorne hasn’t really changed that much. Today it is still hugely popular with surfers and travellers. The beach itself remains pretty much the same since Captain Louttit sort shelter there in 1841. Fat cockatoos fly down from the trees in search of another feed while the waft of eucalypt through the town gives it a distinctly ’Aussie’ flavour. We are so lucky to have some of the best beaches in the world near Geelong. We Aussies continue to love that summer stoke feeling.